Are Resident Issues Stressing You Out? • We understand the unique challenges that you face and we're here to stand in the gap. 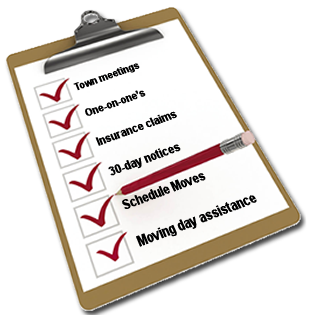 • Our years of experience and interaction with residents keeps them off your "to do" list. • Our services allow you to focus on your core business. • We have a proven record of saving time and money for our clients and keeping the residents happy. • Your reputation and your bottom line will both be strengthened. "Our company utilized Custom Relocation Specialists on three renovation projects in South Carolina. These projects involved renovation of occupied apartment units without relocating the residents. I would recommend CRS without hesitation." "The town hall meetings gave us great insight about the work that was to be done in our individual units as well as on the property as a whole." "CRS utilized cost saving measures in handling three project relocations with an estimated savings of nearly $250,000. CRS is currently under contract with our company to provide relocation services on three other projects of this nature."